ERP is a pretty famous abbreviation for entrepreneurs who ever thought about business operations optimization. Probably, it’s also the most recognizable achievement of the digitized economy in which numerous industries move to the Internet, deploy specific applications such as accounting software or CRM, and increase automation adoption. Respectively, marketers more often decide to find a dedicated enterprise resource planning software company to build own application for specific brand’s needs. This guide is designed for businessmen, CEO, managers, stakeholders, and employees who want to understand the ideas behind ERP better. Slowly moving from basics to more complex stuff, we will find out what is an ERP and how does it work, what companies use ERP apps, and how you can benefit from them. For now, it’s enough to remember that almost every company can get profits from implementing an ERP app, so even SMBs should consider this upgrade for their core processes. Further, we will review this key statement in details. But first and foremost, let’s figure out the basic points of this topic. ERP is a business approach to management emerged around 30 years ago as an idea for manufacturers according to which any given company should streamline core processes such as goods producing or services delivering. Later, the idea spread to other industries, so now ERP is a viable part of any relatively successful brand. Fully integrated parts. An ERP platform should unite all the company’s departments to create a common database with the workspace. Using it, employees and even customers can quickly find data of interest with minimum effort. Common standards. Following the idea of integration, all parts of ERP must work under the same rules. Thanks to this unification, users can send and receive data without extra transformations. It also helps to reduce human errors. Real-time operations. This system should be always on to provide access to the most recent information. It’s even more important for logistics, defense, and finance sectors but small business ERP cloud also should be quick and flexible. Focus on core tasks. With constant increase of overall business complexity, traditional all-in-one systems become less effective. According to the idea of postmodern ERP, enterprise apps can include two and more tiers where the main one covers only core tasks. Technically, all ERP products consist of functional modules for specific tasks, e.g. finance and accounting, HR, manufacturing, warehouse management, supply chain control, customer relations, and so on. Further, we will review these areas in details. Another important conflict in the ERP world is based on two completely different development paths. Adepts of the first one claim that it’s essential to use best practices and create apps with the same features. Their rivals focus on personalized approach. What Is the Difference Between Custom and Ready ERP? Here we are. Two visions and two development ideas. It may sound paradoxical but both sides are happy with the current state because they have their clients. Long story short, a typical enterprise resource planning software company which sells prepackaged products relies on best practices – a set of traditional features widely used in a given industry or on the market at all. Instead, developers of bespoke solutions work with clients who need unique stuff and great competitive advantage. If simpler, out-of-the-box software is faster and easier to implement, tune, and become familiar with. But it may include unnecessary modules or, vice versa, not fulfill all requirements. On the other hand, custom ERP applications are designed according to your exact needs but take more time to be developed and installed. At the end of the day, you should decide which approach is better for your business. Further, we will look at the rivalry between developers in other aspects to help you understand the pros and cons of both types. The majority of ready-made solutions are created by a small number of companies. These market whales have years of experience and thousands of enterprise customers. 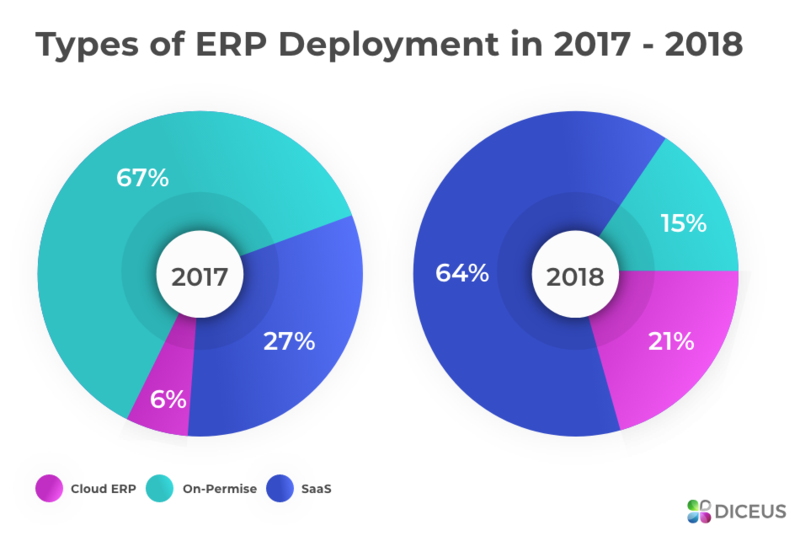 According to 2018 Panorama report (to get a full copy, you should fill out the form), only two vendors handle more than a third of all out-of-the-box ERP deployments. These winners are Oracle with 16% of market share and SAP with 15%. Most of them deliver several packages for different clients. Say, you can order a cloud solution or get a product deployed on your server. Sets of features may vary significantly, so it’s possible to find a more suitable offer. However, ready-made ERP apps can barely provide the highest level of customization. Instead, bespoke programs do provide it. While the market is filled with offers from classic vendors, we think that custom developers are more preferable when you need something unusual. It’s simple to understand as teams which create software from scratch can install nearly any functional module or interface element. You even can get a free demo of a preprogrammed app, check what’s missing and what’s unnecessary, then contact a custom dev team, and ask to develop something similar with required changes! In Diceus, we focus on fully personalized work with each customer. Starting with the first consultation and finishing whenever you want (up to never because we can handle all maintenance issues forever), our team of creative software geeks is ready to develop unique solutions. Whether you want a small business ERP cloud for e-commerce or a hosted app for an international bank, we can design it. The entire development cycle begins and ends inside our company because we are responsible for consulting, project management, data migration, training, QA, tech support, and the development itself. Check our vision and some products in the article about ERP for banking industry. How Enterprise Resource Planning Software for Small Business Functions? Now, it’s time to find an answer for the second part of the previous question: what is an ERP and how does it work? As we already know the basics of ERP structure, let’s figure out how applications functions. Accounting covers budgets and costs. Distribution focuses on SCM and delivery. Finance include general ledger and money flow. HR handles everything related to employees and vacancies. Manufacturing tracks workflows, schedules, and products’ life cycle. Processing covers inventory, orders, and reports. Project management comes as a global resource planning center. All modules are interconnected. They create a single repository for all essential information to boost the data flow across the company’s departments and branches. In modern ERP apps, developers also add CRM support to avoid splitting functions into two programs. Thus, it’s possible to handle both internal and external interactions using a single app. 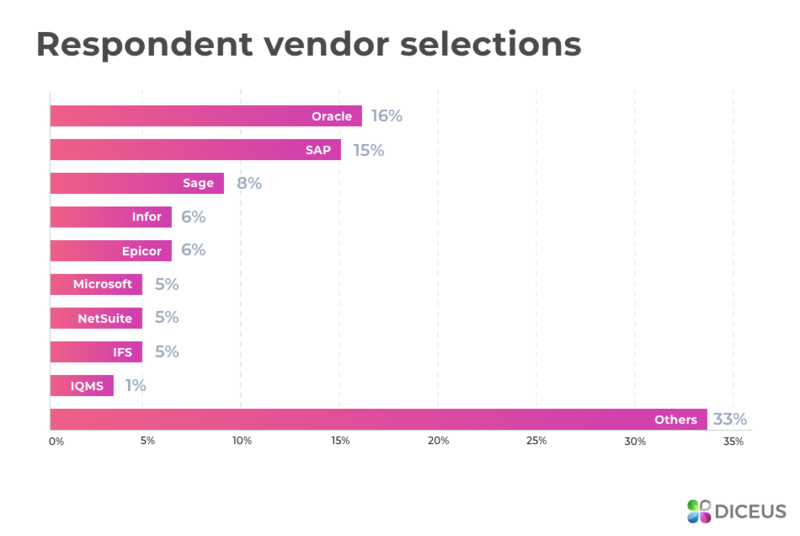 On the other hand, some vendors focus on two-tier ERP products which include not only modules but different separate apps for different tasks. The first approach is better if you want to gather everything in one place while the second is more resource efficient. Small Business ERP Cloud VS Big Enterprises: What Companies Use ERP Systems? 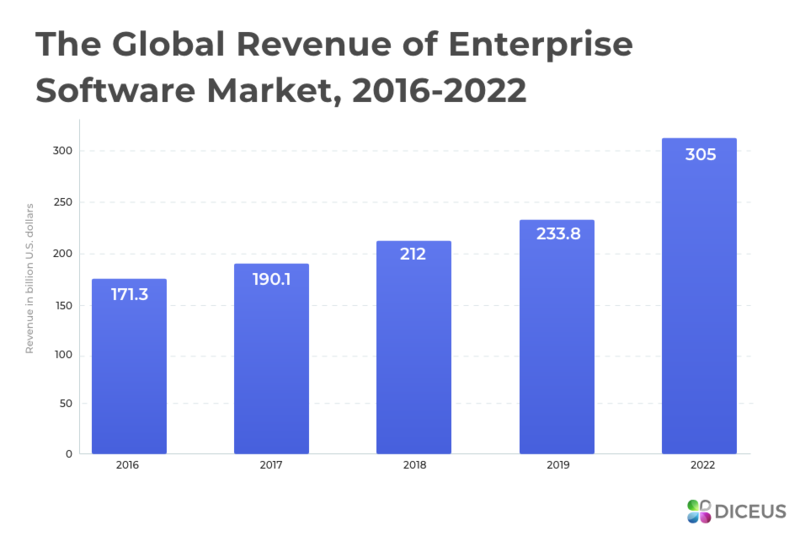 To begin with, the ERP software market is pretty large when it comes to revenue. According to CompTIA, the worldwide IT industry will reach $5 trillion in 2019 and the only software sector will be responsible for 11% of this number or $550 billion. Simultaneously, other insights reveal that the current revenue of ERP applications is $230.5 billion. Means, this type of programs covers more than half of the total software revenue! By 2022 both markets will increase in size and ERP companies will earn $310.2 billion, to note. Thus, it seems that a lot of companies opt for enterprise-grade solutions. Basically, you should implement this type of software if you realize its pros and cons as well as potential benefits related to your current or future needs. Hence, let’s look at how different businesses can use ERP, for example, enterprise resource planning software for small business or tools for multinational corporations. Each case is unique, so we’d suggest conducting independent research tailored to your team and market vision. Software for global enterprise brands is complex, multifunctional, and generally can be considered an all-in-one. Big companies work with numerous clients including both individual customers and entities or other enterprises. Thus, the best choice for these teams is ERP II programs which expand the functionality of traditional ERP analogs with more options for cooperation between businesses. Tier I. Must focus on international aspects like the support of various languages, currencies, postal codes, and taxation rules. Tier I for governments. According to the name, focuses on governmental stuff like accounting or HR. Covers federal levels, mostly. Tier II. Works fine for big corporations without global expansion. Also may support several languages and currencies but in a single region, usually. Tier II for governments. Focuses on state and local authorities. Again, pays high attention to governmental issues instead of private business. Unlike apps for enterprises, tools for SMBs is less powerful and complicated. Usually, minor companies want to get only basic features like accounting and distribution. However, each manager involved in small or mid-sized business should think globally and plan future upgrades. Scalability is essential for new companies even more than for their experienced competitors. In this case, cloud apps are a good choice. In 2018, experts from Panorama (five interesting insights are available via link) also mentioned that cloud solutions for all businesses become more popular. The combined share of SaaS and cloud deployment was 85% and on-premises solutions were responsible for 15% only. Compare it with 33% / 67% ratio in 2017. Obviously, the small business ERP cloud approach is more efficient and suitable for fresh brands but leading vendors like SAP, Oracle, and Microsoft also presented their cloud solutions for big clients. Tier III. Focuses on mid companies which work in one or two countries. Some attention to international relations is required here, too. Tier IV. Is created for small teams operating in a single state or even city. Accounting is the main aspect of such software. What Are the Definitive Benefits of ERP Apps? Data accessibility. It’s enough to input information once without extra checks to get it available in the single storage. Data consistency. Common standards and views allow different branches to process data quickly, without several confirmations. Control over processes. Convenient schedules and dashboards allow workers to oversight every process, set tasks, and get reports. Decline of human errors. Thanks to the high level of automation, it’s almost impossible to take goods from the wrong place or mistype prices. Interconnection. A single document can be used in various departments. Say, an invoice from salesmen acts as a basis for accounting branch and inventory guides. Read about ERP in finance to find out more advantages for a specific industry. Traditionally, in the last section, we’d like to cover basic questions like what companies use ERP systems or how to find a good enterprise resource planning software for small business. Refresh key points of the guide using these questions and answers. What Is ERP in Business? It’s both a business strategy focused on the connection between a company’s parts and applications created to facilitate the realization of this strategy. What Companies Use ERP Systems? Nearly all teams can use ERP. However, this type of software is the most beneficial for companies with at least two departments or branches. Which ERP Type You Can Choose? Basically, there are ready-made and bespoke programs. Also, they can differentiate by deployment (SaaS or hosted), price (free, licensed or once-paid), and size (for large, middle or small businesses). How to Find a Suitable ERP? First and foremost, you should know what your team needs. Basing on this knowledge, you will be able to choose the best software. Requirements vary between corporations and industries, so we suggest consulting with experts if you can’t define goals on your own. Read more about budgets in our article about ERP system cost. Why Should You Choose a Ukrainian ERP Software Company? Ukraine and Eastern Europe are rising stars of the global outsourcing market. Local developers have relatively low prices but good knowledge and enough skills thanks to professional education. They also know English and are close to Western culture. That’s it. ERP may look extremely complicated but we did our best to help you figure out basics and more advanced stuff related to this strategy and software. If you still have questions, feel free to ask us. And if you want to get a consultation or cooperate with our wonderful developers to get your own custom ERP system for any industry and business size, also be sure to get in touch with our experts. Choose vendors wisely as they define the success of your business!